Last Wednesday we noted there is something rotten in the state of Denmark, meaning that the world’s great potemkin village of Bubble Finance is unraveling. The evidence piles up by the day. To wit, now comes still another story about the Red Paddy Wagons rolling out in China. 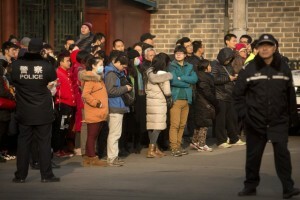 This time they are rounding-up the proprietors of a $7.6 billion peer-to-peer (P2P) lending Ponzi called Ezubao Ltd.
Ezubo investors lined up outside a government office in Beijing last month; having shut down the online peer-to-peer investing. The particulars of this story are worth more than a week of bloviating by the Wall Street economists, strategists and other shills who visit bubblevision the whole day long. That’s because it exposes the rotten foundation on which the entire Red Ponzi and the related world central bank regime of Bubble Finance is based. Needless to say, these dangerous, unstable and incendiary deformations are not even visible to the Keynesian commentariat and policy apparatchiks. They blithely assume that what makes modern economies go is the deft monetary, fiscal and regulatory interventions of the state. By their lights, not much else matters——and most certainly not the condition of household, business and public balance sheets or the level of speculation and leveraged gambling prevalent in financial markets and corporate C-suites. As that pompous fool and #2 apparatchik at the Fed, Stanley Fischer, is wont to say—–such putative bubbles are just second order foot faults. These prosaic nuisances are not the fault of monetary policy in any event, and can be readily minimized through a risible scheme called “macro-prudential” regulation. After all, if the Keynesians had any inkling that debt was a problem they wouldn’t have attempted to radically subsidize it with 84 straight months of ZIRP. 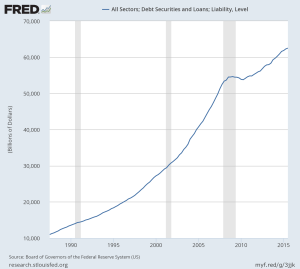 In that respect, they might especially have noted that US credit outstanding has soared from $54 trillion to $63 trillion or 17% since the eve of the financial crisis. That is, since the nation’s mountain of debt blew-up the first time around. So here’s what happened with Ezubao. It’s parent (Yucheng Group) was an equipment leasing operation, having gotten started way back near the dawn of the Red Ponzi. That is, it apparently started about 2012 in the business of supplying rentable equipment and factoring services via the shadow banking system during China’s fixed asset boom. Yucheng Group was definitely not China’s equivalent of General Electric; it was apparently organized by a gang of military buccaneers who have occupied a certain Chinese speaking province of northern Myanmar. Founded in 2012, Yucheng started as one of the pioneers of finance leasing and focused on fulfilling the financing needs at the county level. Yucheng quickly grew its business by expanding into different cities and continued to develop innovative solutions to address their clients’ evolving financing demands. 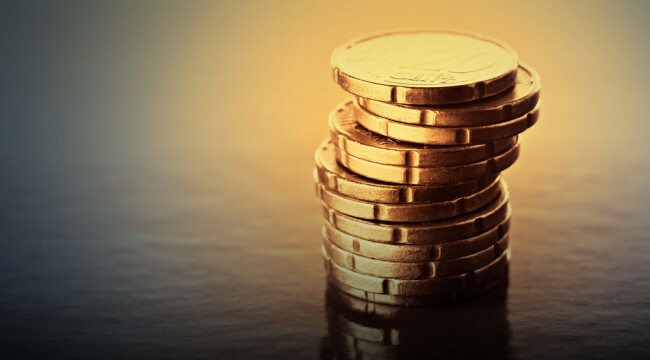 In 2014, Yucheng successfully launched Ezubo.com, a disruptive A2P (asset-to-peer) online platform that bridges borrowers and lenders to facilitate a more efficient transactional process. As of June 2015, Ezubo.com is ranked second in terms of daily average investment amount. Yucheng now sets the industry benchmark by offering a comprehensive range of market leading finance lease and factoring solutions to large and medium-sized companies, international corporations, small and private enterprises to individuals. Well, not exactly. Ezubao was shutdown on December 8th by Chinese authorities, meaning that in just 18 months it had bilked 900,000 investors of nearly $8 billion in a fraud that was so blatant that it now appears upwards of 95% of investor deposits never were invested at all. Some of the money was just send back to earlier investors, upwards $1 billion apparently went to fund the company’s military adventures in Myanmar and the rest to fund the chairman’s lavish lifestyle. …….. prosecutors said that Ezubo didn’t invest the money it collected, but rather used it to pay down earlier debt—and to fund lavish lifestyles for Yucheng’s Mr. Ding and several female executives. Mr. Ding allegedly gave one favored colleague a 130 million yuan ($19.7 million) villa in Singapore, a pink diamond worth 12 million yuan, luxury cars and 550 million yuan in cash. Xinhua said Ezubo employees sought to conceal evidence as prosecutors closed in, at one point burying more than 1,200 accounting books in 80 plastic bags six meters underground in the outskirts of Hefei, the capital of China’s eastern province of Anhui. Yucheng was raising capital through Ezubo at an annual interest rate of 14 percent and lending it out for 6 percent,” he said. The investor said he couldn’t understand how the company could be profitable (!) considering it was paying more to attract money than it was collecting in interest on loans. China’s construction infrastructure, for example, is grotesquely overbuilt—— from cement kilns, to construction equipment manufacturers and distributors, to sand and gravel movers, to construction site vendors of every stripe. 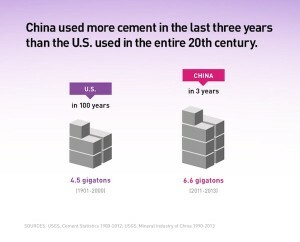 For crying out loud, in three recent year China used more cement than did the United States during the entire 20th century! Accordingly, China has become such a den of speculative madness that one giant scam after another literally springs up over night. During about 60 trading daysbetween March and mid-June of 2015, for instance, China’s stock market soared by $4 trillion and margin loans and other speculative capital poured into its 379 million trading accounts literally like lemmings surging toward the sea. At the peak, margin debt accounted for 18% of the entire market cap of traded stocks. Most of that $4 trillion disappeared in less than 20 trading days through the June/early July crash last year. And not withstanding the subsequent massive stock buying by the authorities and the police state dragnet thrown up against stock sellers, more than $8 trillion has now completely evaporated after January’s wipeout on the Shanghai market. The P2P lending story is the same. As investors sought alternatives to the sagging real-estate market and volatile stocks, they poured into online peer-to-peer lending platforms with alacrity. According to the WSJ, there were 2,600 platforms operating at the end of 2015 compared to only 800 twenty-four months earlier. More significantly, the outstanding volume of loans soared from $5 billion to $67billion during the same period. Failed P2P platforms have become so common that the industry data provider Wangdaizhijia Co. keeps a data sheet called “problematic platforms”—a list that by the end of last year had grown to 1,263 platforms from 104 at the start of 2014. Analysts say most are cases of “runaway bosses,” in which senior executives flee as financial problems rise at their firms. Nor is this the only scam that came to light over the weekend with respect to the Red Ponzi. It turns out that a certain kind of shadow banking system instrument called Directional Asset Management Plans (DAMPs) or Trust Beneficiary Rights (TBRs) have soared from $300 billion in 2012 to $1.8 trillion at present. Yes, this is another 6X eruption in record time, but it doesn’t take much investigation to see what is going on. Bad loans are literally being vacuumed off bank balance sheets into phony SIV-like entities of Citigroup circa 2007 vintage, and then carried not as loans but “investment receivables”. To provide a buffer against tough times, banks are required to set aside capital against their credit assets – the riskier the asset, the more capital must be set aside, earning them nothing. Loans typically carry a 100 percent risk weighting, but these investment products often carry a quarter of that, so banks can keep less money in reserve and lend more. Banks must also make provision of at least 2.5 percent for their loan books as a prudent estimate of potential defaults, while provisions for these products ranged between just 0.02 and 0.35 percent of the capital value at the main Chinese banks at the end of June, Moody’s Investors Service said in a note last month. At China’s mid-tier lender Industrial Bank Co, for example, the volume of investment receivables doubled over the first nine months of 2015 to 1.76 trillion yuan ($267 billion). This is equivalent to its entire loan book – and to the total assets in the Philippine banking system, filings showed. Industrial Bank declined to comment for this story. Needless to say, there is an endless amount of financial madness where Ezubao, DAMPs and TBRs came from. Yet China is only the tip of the iceberg. If China’s buccaneers and gamblers are slightly more crude, what they are doing is essentially no different than the outpouring of OTC structured finance deals manufactured day in and day out by Goldman Sachs and the rest of the world’s financial market banksters. And they don’t even compare to the financial scam that is at the very heart of present day central banking. No one with a passing acquaintance with history and logic could believe that any Ponzi can be sustained for very long; nor is it possible to believe that massive debt monetization via printing press credit and a sustained regime of negative real, and now nominal, interest rates will not eventually end in catastrophe—–most especially in a world where governments positively cannot stop accruing unrepayable and soon unserviceable debt. Yet after last Friday’s lunatic move to negative interest rates by the BOJ, the Japanese 10-year bond is now trading at just 6 basis points; and it will be in negative territory along with all of the government’s shorter maturities any day now. So why would Mr. Ding Ning not have a go at the blatant Ponzi reflected in Ezubao? Japan’s work force and population is disappearing into a colossal demographic bust; its fiscal deficit is still upwards of 40% of its annual budget outlays; and its national debt is off the charts. So as its retirees liquidate their savings at an accelerating rate, Japan will desperately need to borrow from the rest of the world to support its old age colony. What it has elected to do, however, is trash its currency and ensure that in a few short years its monetary system will collapse. There can be no other result because negative interest rates will cause capital to flee, even as its massive bond purchase programs swallows up most of the public debt, along with an increasing quotient of corporate bonds and even ETFs and stock. In a word, the utter fools running Japan Inc. have become so befuddled by Keynesian groupthink that they are self-inflicting a monetary Hiroshima on their entire economy and society. Likewise, the madness of NIRP is probably no longer containable since it already infects the eurozone, Sweden, Switzerland, Denmark, Japan——-and, after last night’s shocking trade report for January, South Korea can’t be far behind. Its exports are now down 18.5% year over year, and have plunged to levels not seen since the bottom of the Great Recession. Literally speaking, world trade is being asphyxiated by the deflationary burden of the $225 trillion credit bubble created by the Fed and its fellow-traveling convoy of global central banks over the last two decades. And now they are aggressively making matters worse by doubling down on a monumentally failed experiment in crank economics. 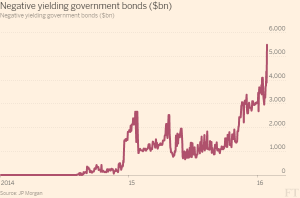 Already they have driven nearly $6 trillion of sovereign debt below the zero bound. Even a decade ago every student of economics 101 knew that is a recipe for calamity. Yet now just a few dozen monetary apparatchiks in the world’s major central banks and their shills in the world’s financial casinos are driving the system straight toward the monetary dark side. What will be uncovered when it finally blows will cause the depredations of Charles Ponzi and Mr. Ding Ning to be reduced to mere footnotes in the annals of monetary infamy.